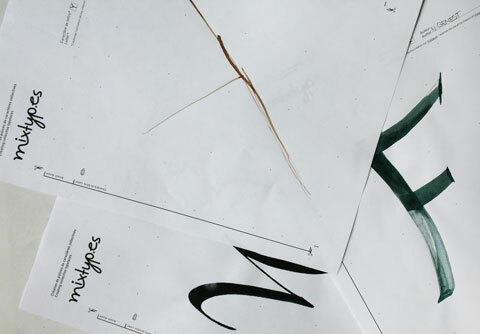 Mixtyp.es' experimental workshop invites participants of all ages and backgrounds to create personal letters by exploring diverse supports and mediums. Participants may also download existing letters from the project Web site, modify them and upload the new created letter forms. The intention is to explore to which degree individual letters, made by people that are most of the time not trained for it, can be used in a complete alphabet and therefore create semiotic meaning. The open culture idea is supposed to be investigated, meaning that this project is only enabled through the co-creation of participants that are invited by diverse mediums, such as the project Web site or the experimental workshop. By using a provided template, by reusing existing creations and by mixing or applying the created letters on the project web site all participants become type designers. Eventually, the final work depends on everyone else.